Most people walk by the little, pink Michaelskirche church in the heart of Salzburg, since it stands between some of the city′s prime attractions such as the Salzburger Dom or the Neue Residenz and the Mozartplatz. However, the Michaelskirche is a charming piece of architecture and deserves some attention. It is re-modelled in late-Baroque style, although the core of the building was medieval. 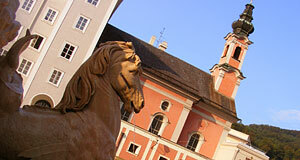 At this site, Salzburg′s first parish church was built, with its oldest record dating back to 813. Next to this church, the city had its official cemetery, which was later called "Domfriedhof" or "cathedral cemetery" until it was demolished in 1598 and transferred to St. Sebastian Church. Abbot Beda Seeauer of St. Peter′s Abbey re-modelled the Michaelskirche based on its Romanesque foundations between 1767 and 1776. The church belongs to St. Peter′s Abbey and many craftsmen that worked on the Stiftskirche were also in charge with the construction works performed here. The doors of St. Michael′s Church bear metal decorations in Rococo. The stucco works in the interiors were done by Benedikt Zöpf in Rococo, too, and the altar paintings are by Franz Xaver König. One of the side-chapels holds an altar painting by Johann Michael Rottmayer from 1690. It shows St. Nicolaus of Tolention having a vision of Jesus Christ as a child.